Antonovka is a wide spread in Russia kind of apples. The season for them is late summer and early autumn. They normally look green, improperly shaped and taste quite sour. But their smell is everything, impossible to confuse with other apples. They easily soften and become a puree when cooked and their flavor gets much milder. I added some oatmeal flour to this recipe to try how it works and I liked the result. The apples flavor is the strongest, so oatmeal comes out very subtle and gives the muffins a bit of granola touch. If you don't want to add it, just use all purpose flour instead. Soak the nuts in hot water (add 1 tbs Whiskey if you wish) for 15-20 minutes, then drain. Combine the dry ingredients and mix well, to make sure baking powder is spread equally. Puree the apples in a food processor. Add some milk to help them blend if needed. Pour the rest of the milk and vegetable oil into the dry ingredients, mix gently with a spatula, just to get the dry ingredients wet. Mix in the apple puree and walnuts. Be careful not to over mix the batter. It doesn't have to be perfectly smooth. Just make sure there are no big lumps of dry ingredients. Slightly oil the baking cups, fill them with batter to 3/4 of their hight. Bake at 200C for 18 - 20 minutes. 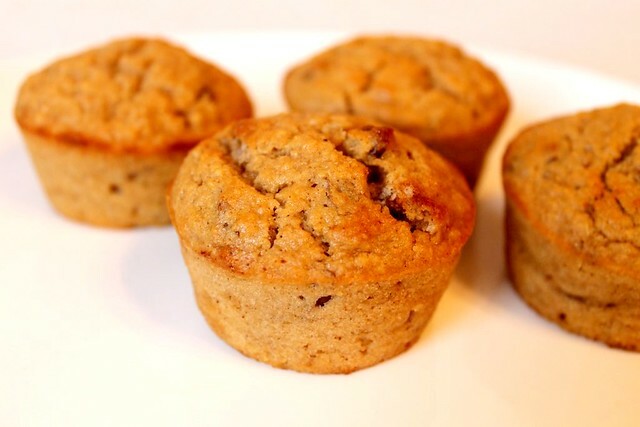 The muffins are ready when the wooden stick inserted in the center of a muffin comes out clean. Let stand for 3 minutes and take out of the baking cups. The muffins are best eaten right away. If you need to store them - let them cool to room temperature and refrigerate in an airtight container (they will keep for 2-3 days). In the freezer they will easily keep for 2 weeks. Yes, that's right. We have them in season only and they are only available at the markets, not from organized retail.. It is amazing how different and how full of flavor they are. I recently found that we have a projects supporting private farming, like this one: lavkalavka.ru - hope they will help to keep this kind of products available.